From left are: Denise Stryker, Executive Director; Nancy McCormick, Vice President; Billie Baker, Assistant Treasurer; and Dan Mayo, Shelter Board President. 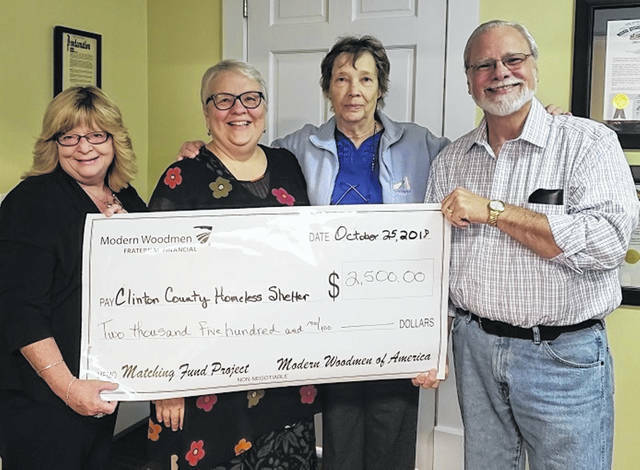 WILMINGTON — The Wilmington Chapter of Modern Woodmen of America teamed up with the Clinton County Homeless Shelter to help raise funds for the work of the shelter through the annual Cardboard City event. Cardboard City was held Saturday, Sept. 15 on the grounds of the Clinton County Courthouse. Church groups, businesses and community organizations all participate. The AM Rotary partners with the shelter and has coordinated the event for the past 20 years. Executive Director Denise Stryker said, “On behalf of the Clinton County Homeless Shelter, I want to say how very thankful we are for the donation of $2500.00 in matching funds from Modern Woodmen for Cardboard City 2018. “The shelter provides emergency shelter for more than 200 men, women and children in our community each year. Many other essential services including a food pantry, donations of clothing, and household items are shared with our neighbors in a time of need. Approximately 125 community members gather together at the Clinton County Courthouse on the third Saturday of September each year to sleep in a cardboard box, raising awareness of the plight of those experiencing homelessness and funds to help with shelter operations. Founded in 1883 as a fraternal benefit society, Modern Woodmen of America offers financial services and fraternal member benefits to individuals and families throughout the United States. For more information about Modern Woodmen and its services, call District Agent Dan Mayo at 937 725-0445.